In short, Jaipur is the capital of Rajasthan, one of India’s most modern and functioning states. It is known as the Pink City because its outer walls and gates are painted pink in honor of a visit from England’s Prince Albert in 1876. The Maharaja at the time –Sawai Ram Singh II wanted to impress the Prince so he ordered the entire city painted. It was a way for the Maharaja to form stronger ties with the British. This is one of the top destinations for most tourists and I contend because it’s actually a “walkable and shopable” destination and the quality of the goods warrant a look and purchase. We left Jaipur and headed on an eight-hour journey to Udaipur. Still weakened from my bout with Delhi Belly, I didn’t eat much in preparation for the voyage. I’ve decided in this country safe is definitely the way to go. 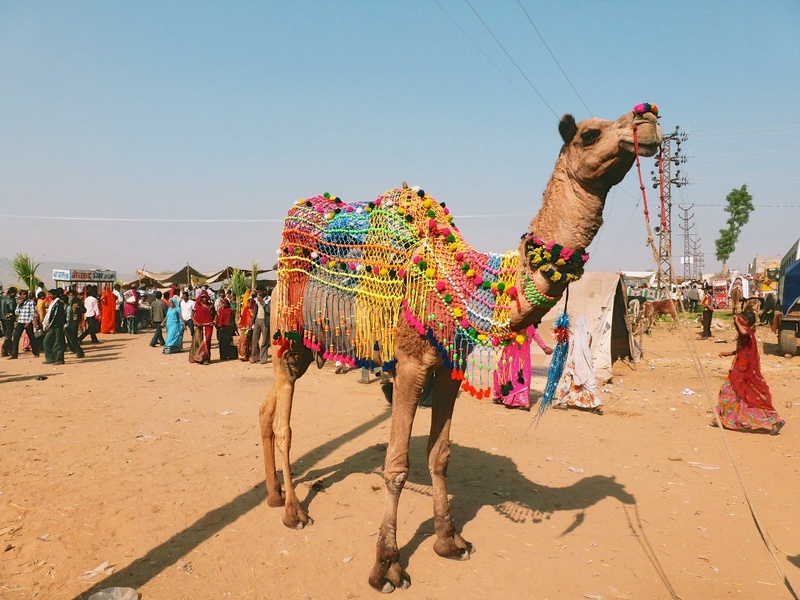 We planned a stop in Pushkar for the annual Camel Fair that brings out hundreds of thousands of Indians and tourists for the five-day event. The Camel Fair is one of the world’s largest and involves livestock trading as well but I could hardly see anything with the 10 deep crowds of people on the walkways. We caught the last day and missed most of the camels but let me tell you this we did not miss the masses of humanity. It was 80+ degrees, bodies everywhere of all different socio-economic backgrounds, sand, dirty pools of water on the ground, animal dung, and a massive amount of merchandise selling. There were tourists gathered around the tight rope performers and gymnasts, more flies on fruit than bees on honey and smells of varying degrees. It’s like we were asking for trouble. I couldn’t even use their version of the toilet. I walked in the “bathroom” and a heavy scent of human feces greeted by nose and feet and I started dry heaving. Sometimes doing as the locals do (men that is) and utilizing the outdoors makes a whole lot of sense. I am glad we attended the fair but it was an overwhelming experience. Our driver Jayveer who has been our protector for the last six days pushed us through the madness to make sure we met the Camel Fair winner donned in brightly colored harness. We snapped some photos, bought some bangles to prove we were there, elbowed with more of humanity than is ever necessary and were back on the road to Udaipur. Udaipur is known as the City of Lakes and often considered the Venice of the East. It lives up to its reputation. The Aravalli Mountain range, the longest in India, hugs the city and within their natural landscape rests seven connecting lakes giving Udaipur a sparkle like no other city we have visited thus far. Former Royal Palaces now converted into five star hotels line the waterfront and narrow streets give way to the Old City, merchant shops and bargaining tourists. Udaipur is one of the smaller “big” cities with a population of 500,000. It was founded in 1559 and is the third capital of the Mawar Dynasty, the longest serving dynasty in the world. The Royal Family still resides in Udaipur, while their power shifted to that of ceremonial they still yield some influence in the city. We had a lovely guide Umeed who showed us the City Palace – part living quarters for the Royal Family and part museum. When Indira Ghandi served as the prime minister, she stripped India’s Royal families of their government payments. Most were forced to sell their property, while other resourceful royals converted their residences into hotels, which is why so many of the families are managing massive hotel or hospitality groups in India. Construction of the Palace began in 1559 by Maharana Udai Singh (the founder of the city) and 22 kings reigned from this palace for the next 300 years. The City Palace towers along the banks of Lake Pichola, as does one of the former residences resting like an island in the center of the lake. The lakes in the area depend greatly on the runoff from the mountains to keep them full. There are many years when the lakes are barren especially when Monsoon season provides little rain and it seems the city does its best to keep them clean. A tour of the palace and boat ride on Lake Pichola are the highlights of a visit to Udaipur but I quite enjoyed the casual and very peaceful lunch we had looking out on Lake Fatesigir. Our guide Umeed joined us and I immediately grilled him on his marriage – my current topic of choice. His story differed from most as his family placed an advertisement with the marriage bureau. When potential brides responded (their families), he and his family would go to visit her and her family. When I asked how many women he met before finding his wife, he responded, “innumerable.” He did meet a few women he was interested in marrying but after seeing the Brahman(Hindu Priest) and participating in the reading of the horoscopes some were not considered not a good match. Astrology is very important to Hinduism and if the charts do not align then the marriage is doomed. It works well in their favor. You rarely hear of divorce in India (it’s prohibited in Hinduism). It strikes me as significant that families and astrological charts know better than the young but it works. Our belly’s full and our guide tongue tied we retreated to our favorite stomping grounds – the shops for more scarves, more tailored shirts and just plain more.